Since 1992, Delta-X Research has invested in the research and development of advanced analytics for assessing the health of high-voltage equipment. Generation, transmission and distribution utilities around the world, as well as leading industrial operations, rely on Delta-X Research to provide key independent decision support tools for managing their critical assets. Our flagship offer, Transformer Oil Analyst (TOA4) is used by over half of the largest utilities in the USA. It supports a large community whose combined experience over two decades has been applied to create the most effective and recognized diagnostic tool for assessing and tracking the condition of high-voltage electrical apparatus. We recently released an innovative new approach to dissolved gas analysis called Reliability-based DGA. Rather than using the norms employed by conventional DGA, Reliability-based DGA applies an advanced statistical model derived from large data sets of real-world transformer DGA histories and DGA-related failures, assessing the gassing behaviour of transformers to provide event severity, hazard factor and fault type. 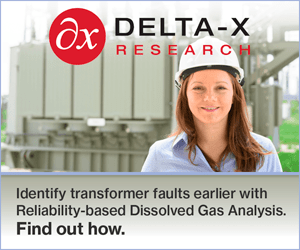 At Delta-X Research, we strive to bring science to transformer risk management. Company : Delta-X Research Inc.